This Federal/Neo-Classical style building has two stories, a metal roof and is intact. It has a three-bay, center entrance and brick construction laid up in Flemish bond. It has a hipped roof with a balustrade in alternating paneled and geometric railing sections. The entablature is topped by a pediment with modillions and a tall cylindrical lantern with modillions, supported with eight fluted Doric columns and topped with a spire. Paired Ionic columns support the entablature and flank the central entrance. There are Ionic pilasters at the outer edges of the front façade. A shallow ell projects from the left side with a cross-hipped roof. There are brick chimneys – four side wall, right and one side wall, left. The door surround has a segmentally arched transom, 2/3rds-length sidelights with panels below; original or early or early wood paneled front door. There are blind archways with windows in outer bays of the front façade. The building is eight bays deep with intact 6-over-6 windows, limestone lintels, flared headers, (cylindrical metal fire-stop shade holders attached), and authentic wood paneled shutters. 1893 Sanborn Map labels bldg as follows: “Bank” in right front section, “Library” in left front section, “Stage & Scenery” in rear, “Hall – 2nd [floor],” & rear addition as “Assembly Hall”. Isaac Damon was born in 1781. At age 30, he moved from Weymouth (MA) to Northampton (MA). His wife died the following year, and he married Sophia Strong (pictured), who delivered eight children. Over the course of his career, Damon built at least 13 churches, 14 other buildings, and 25 bridges. Most of his buildings were constructed in the Connecticut River Valley, but his bridge work took him farther afield. His fully-enclosed bell towers and steeples are easily recognized throughout his region of influence. He retired in 1852 at the age of 71 and died ten years later. Following From: Biographical Dictionary of American Architects (Deceased) by Henry F. Withey, AIA & Elsie Rathburn Withey. (Los Angeles, CA: Hennessey & Ingalls, Inc., 1970). “Architect-building in western Massachusetts for more than three decades, his work included a number of public buildings, mainly churches. It is believed that Damon was one of the junior draftsmen in the Town & Davis office in New York, and when in 1811 he was called to Northampton to build the First Congregational Church, it seems probable that Ithiel Town helped prepare the plans (*). The church, one of the largest and most elaborate in New England at the time of its erection stood until 1878 when it was destroyed by fire. In Northampton Mr. Damon also designed the Town Hall built in 1823 (*). “In the course of years he executed many important commissions, and the drawings, some of them in India ink, showed skill in draftsmanship. In his work as builder he was one of the first to understand the use of a truss and incorporated it in the bridgework of a number of buildings. Thirteen or more churches in the western part of the state are ascribed to him among which should be named the First Church at Lenox, dating from 1814; the First Church at Springfield, 1818 (**); the old Meeting House at Ware, 1820 (**), and the Unitarian Meeting House at Greenfield. In addition he was architect of the county Court House at Lenox (an early building from 1814); and probably designed (at least he was paid for making the plans) the oldest group of buildings at Amherst College, including the North and South halls and the Chapel between 1821 and 1827 (***). Built in 1815, this was Lenox’s Second County Courthouse. The First Courthouse, a wooden structure built shortly after Lenox became the county seat in 1787, was not large enough to adequately serve the needs of the county court. The new Courthouse was a far more imposing structure, costing the county $26,059, a substantial sum in 1815. The Courthouse quickly became a landmark, and came to symbolize Lenox’s position of prominence in the region. When the county seat moved to Pittsfield in 1868, this building was vacated, and its fate uncertain. Mrs. Adeline Schermerhorn, a long-time summer resident of Lenox, heard about the impending auction of the building at her winter residence in Rome, and commissioned Judge Julius Rockwell to secure the property to be held in trust for the people of Lenox as a free public library. Mrs. Schermerhorn died before the deed could be executed, but her children carried out her wishes, and conveyed the property to the five trustees named by their mother. At her request the building was named the Charles Sedgwick Library, after the popular Clerk of the Courts and citizen of Lenox. The library was dedicated in January of 1874. The rooms formerly occupied by the probate court were leased to the selectmen as town offices. 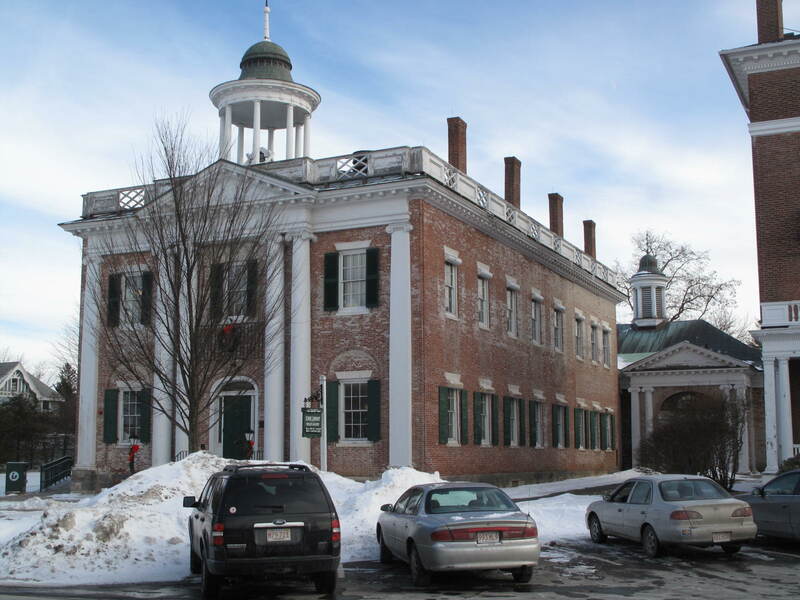 The Lenox Library Association, which had been formed in 1797 and originally housed in the First County Courthouse, decided to move from its 1856 brick building (on the present site of the Congregational Chapel) and consolidate its collection with the Sedgwick Library. Currently serves as the Lenox Library.